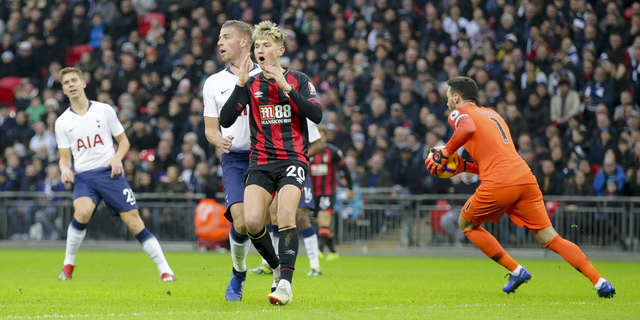 There was little Boxing Day cheer for AFC Bournemouth at Wembley as they lost 5-0 to Tottenham Hotspur. After a meandering start in which the best chance had fallen to the away side, Spurs were given an almighty helping hand as a heavily-deflected Christian Eriksen shot bobbled in past the blameless Asmir Begovic. There was nothing lucky about the second, a crisp Son Heung-Min strike from the edge of the area, and a flowing move forwards notched a third before half time, Lucas Moura rounding off the attack with a clean finish. The half ended in worrying fashion with Simon Francis leaving the pitch on a stretcher. A fourth followed from Spurs and Harry Kane on the hour mark and Son scored his second as he scrambled in, the South Korean's goal the end to the scoring as the Cherries dropped to defeat. Eddie Howe made one change to his 11 from the side that beat Brighton. Ryan Fraser, who came on and recorded an assist at the weekend, replaced Joshua King in the starting line-up, the switch moving Junior Stanislas into a central role behind Callum Wilson in attack. Kicking-off for their third ever match at Wembley, the Cherries got the game under way and held their own amidst a muted opening ten minutes. Holding their shape in their own half, absorbing Spurs' possession and then looking to counter, the tactic working when Francis slid to cross from the byline. Fraser was perfectly positioned at the back post but his header was blocked by Stanislas in front of him trying to get out of the way. If the luck wasn't on the visitors' side, it certainly was on the hosts' when they took the lead. Working the play down the right, Kyle Walker-Peters passed inside to Eriksen 25 yards from goal. The Dane elected to shoot and the low effort diverted off Jefferson Lerma's shin and span into the unguarded right side of the goal. The Cherries fell two behind when Son's excellent recent form continued with a well-executed swish of his right boot inside the D and inside the far post to increase the lead just past the halfway point of the opening period. Bournemouth contained Spurs for ten minutes but conceded a third when a good attacking move culminated with Walker-Peters volleying a ball back from the byline with Moura ready to slot home from ten yards to make the advantage three goals. Stanislas swatted at a volley which flew over before testing Hugo Lloris with a low near-post effort that the 'keeper was able to hold on to. The attacker's third chance within a few minutes was probably the best, a free header from nine yards out which was at Lloris when a yard either side of the World Cup winner would have notched the Cherries on the score sheet. There was a moment of real worry for Bournemouth when Francis crumbled to the turf unchallenged, the medics taking some time to tend to the stricken skipper, who left the field on a stretcher with his right knee in a brace. 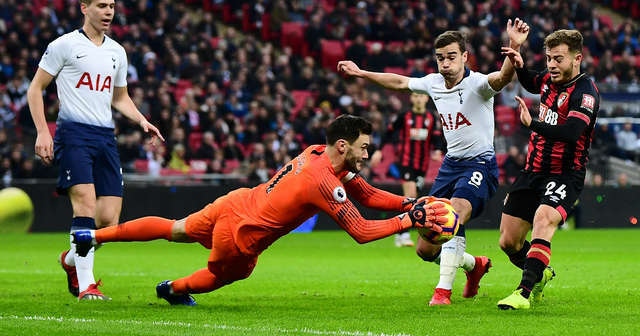 Lloris saved again as some fine wing play from David Brooks and Fraser lofted a centre aerially into Charlie Daniels' path, and while the goalwards effort was good, the 'keeper again was able to repel. The away end were calling for a penalty moments after the restart for the second half when Wilson was bundled over by Juan Foyth in the box, the referee waving away the protests, and Stanislas was soon sliding in to put the ball in the net, but moments after he'd converted Diego Rico's cross the flag was up for offside. The Cherries were knocking at the door for a way back into the contest, but hopes were all but extinguished when Eriksen's looped ball over the defence was turned home on the volley by Kane. Stanislas had another shot blocked after he was found in space in the left side of the area, and after Lys Mousset was introduced for Wilson, the French striker headed a good Rico cross just wide of the post. Spurs scrambled home a fifth, despite Begovic's best efforts. Kane played the ball back to Moura whose effort was saved, but picking up the pieces was Son who sidestepped the 'keeper to convert from inside the six-yard box. Further away calls for a penalty were turned away when Stanislas' shot appeared to be blocked by an outstretched Toby Alderweirwld arm, and Daniels whistled an almost Manchester City-esque half volley narrowly wide as the Cherries continued their search for a goal. While Bournemouth continued their efforts for a consolation to the end, Rico hitting a spectacular effort just over the angle and Stanislas volleying wide, even that didn't arrive on a day when nothing went the away side's way at Wembley. Heading up Wembley Way to watch their team at the national stadium for the third time in the club's history, the Cherries fans would have known their side would need to start well, and that's what they did, holding Tottenham at arm's length while also creating two really good openings, which were unable to be taken. Away at Spurs teams are always likely to need a rub of the green, but any hope of that happening evaporated with the fortune falling for Eriksen's opener, and for the rest of the half the hosts rarely looked like taking their foot off the pedal. 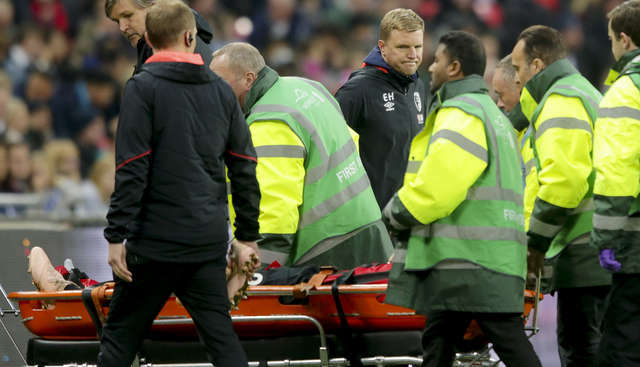 The nature of the Bournemouth captain's fall on halfway, coupled with the way he left the field with his knee heavily stabilised were a cause of real concern in the away dugout. The Cherries contingent will now be joined in hoping for the best for Francis and for some positive news to emanate regarding their important defender.